November & December page from the Naruto Shippuuden 2009 A calendar featuring Naruto and Sasuke. This is too amazing scan,ooh Sasuke come back! Such a BEAUTIFUL and sad image! Sasuke and Naruto are so cool! Thanks for the share! nice scan even though 4 some reason this scan makes me depress. 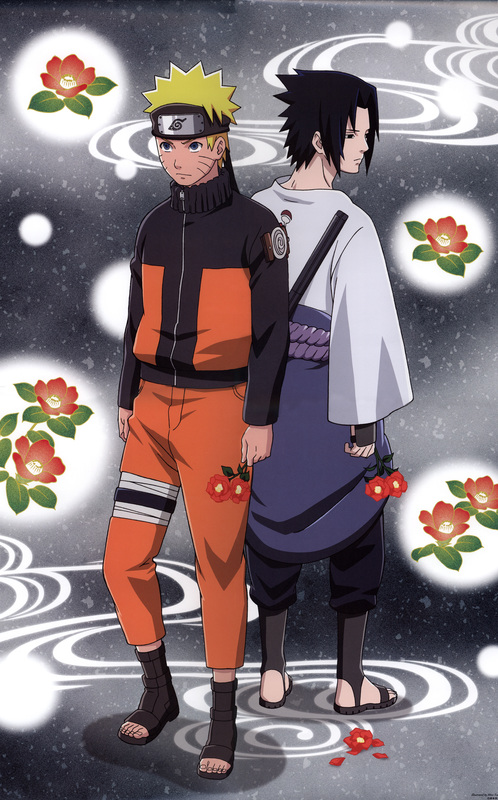 ehhhh?why they both holding the red flowers? doesn't that flower represent something in japan right? I love both of them very very much. so beautiful *__* so this is from a calendar? I so wanna this! TwT these two are so good together! great scan, really. Camellias as well? Uh? Ouch, that might hurt. Great and emotional picture, this one. Thanks for sharing!